You’ll know it’s too late when your pantry is empty, right along with grocery store shelves, no water comes from your tap, there’s no electricity, and fifty zombies are shambling up your driveway. Until then, you have time to prepare! 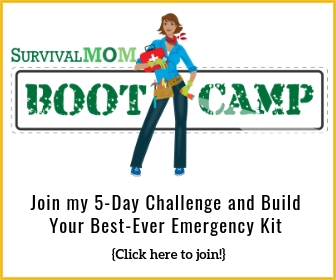 Here is The Survival Mom’s Quick Start Guide for getting prepared in a hurry. One small disclaimer: I have absolutely no idea exactly what is going to happen in our country, around the world, or in your particular neighborhood or when. This advice is given to those who feel nervous about the future and want a game plan to get prepared quickly. Decide what you’re preparing for. This step helps clarify your focus and set priorities. While some things are the same for most emergencies, preparing for income loss, hurricane, power outage, earthquake, etc. each require a different approach. Examine your financial situation. How much money do you have to spend on preparedness? If you’re in a hurry to improve your family’s odds of survival, you’ll need a healthy amount of money on hand. 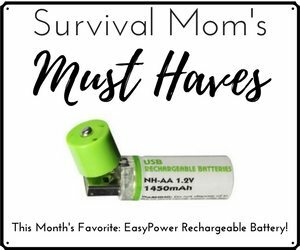 Survival Moms (and Dads) who have been at this a while have spread out their expenses over many months and years. Do not go into debt in order to be prepared. You don’t want to face an uncertain future with credit card bills arriving every month. Do what you can with what you have. Make a list of simple breakfasts, lunches, and dinners that you can make with ingredients that do not require refrigeration, in case of a power outage. These recipes should be simple and easy to prepare. In the face of the apocalypse, do you really want to be slaving over a hot stove three times a day? I think not. They should also be things your family will really eat. By the way, there’s nothing wrong with planning on eating the same meals over and over again. There’s also nothing wrong with deciding that eating canned soup for lunch is a good thing. You’re establishing your back-to-the-wall food storage supply. The Famine Menu can help you stock up on the bare-bones basics. Make a grocery list of all the ingredients to make your recipes from Step 4 cover 31 days (Month #1) and then go shopping. If you can get your hands on coupons and can check the grocery store ads for discounts, so much the better. Besides food, you’ll need cleaning supplies, laundry soap, extra prescription and over-the-counter drugs. Your pets will need their own food and supplies. Print out a copy of my Costco TEOTWAWKI shopping guide to help you decide what other supplies your family should have on hand. Decide how you want to safeguard your finances. The prices of gold and silver have been rising steadily as the value of the dollar declines. Do you want to take a portion of your cash and purchase gold and silver? Do you want to have cash on hand in case of a bank holiday or some other disaster that would prevent you from using ATMs, money transfers, and other convenient bank services? Are you adequately insured? It’s hard to tell how a national financial crisis would affect insurance carriers, but with a policy in hand, you’ll have some recourse if your home is vandalized, your car is stolen, etc. Water is vital to survival, but it’s unlikely that a chaotic economy would necessarily shut down water treatment plants. If you are preparing for a different situation (pretty much any natural disaster), then you should store at least one gallon per person per day. A family of four needs at least 28 gallons to meet their needs for a week. You can buy a few cases of bottled water, but sturdier water containers are better. My own favorite is the lowly 2-liter soda bottle, cleaned out and refilled with water. Make a plan for keeping your home comfortable – cool in the summer and warm in the winter – without electricity. Many natural disasters and extreme weather events cause power outages. Even something as simple as high winds can cause downed power lines and outages that may take days to fix. Again, chaos in Washington D.C. doesn’t mean our power grid is in danger, but if government regulations cause energy prices to rise drastically, most of us will be looking for ways to use a lot less electricity, even during a heat wave or blizzard. You should have alternate ways of staying warm and cool, as well as ways to cook food and heat up water. Don’t take the health of your family lightly. Increased turmoil will cause more people to seek help from hospitals and doctors. Make sure you have a well-equipped first aid kit, download or purchase a good first aid book, and, if at all possible, have at least one person with current CPR and first aid certifications. Bonus points for someone with Wilderness First Aid or Nursing Assistant training. In a medical crisis, you and your family might be on your own, at least for a while. We take transportation for granted, but you should have a secondary way to get around town. I recommend a bicycle with either a small trailer or baskets. If roads are blocked, the price of gasoline skyrockets, or an EMP renders your car useless, you’ll be glad you have at least a bike to get where you need to go. Consider some worst-case scenarios. What if a financial crisis causes a drastic increase in crime? What if riots and protests erupt outside your home or workplace? What if desperate family members show up at your door in need of shelter and food? It doesn’t hurt to let your mind run wild and picture these scenarios, and others, as long as you continue thinking and planning how you and your family might cope. You can’t learning everything there is to know about survival in just a few days. 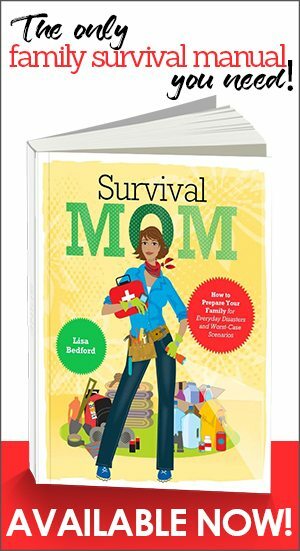 Check out my list of 30 survival must-have books and make a trip to a bookstore or the Amazon website. A good survival library is worth its weight in $1600-an-ounce gold! How do you propose to keep what you’ve stockpiled? In other words, do you have a security system planned? This could be an actual security system installed in your home, but those aren’t fool-proof. Firearms make sense, but do not purchase a gun unless you are trained in its use or are committed to taking training classes and can frequently practice at a gun range. At the very least, your family should have a shotgun (12-gauge is most popular although a 20-gauge will have less recoil) and a handgun (preferably 9 mm, .40 or 45 caliber). I cannot stress enough the importance of training and practice. How much ammo should you have on hand? As much as you can afford. 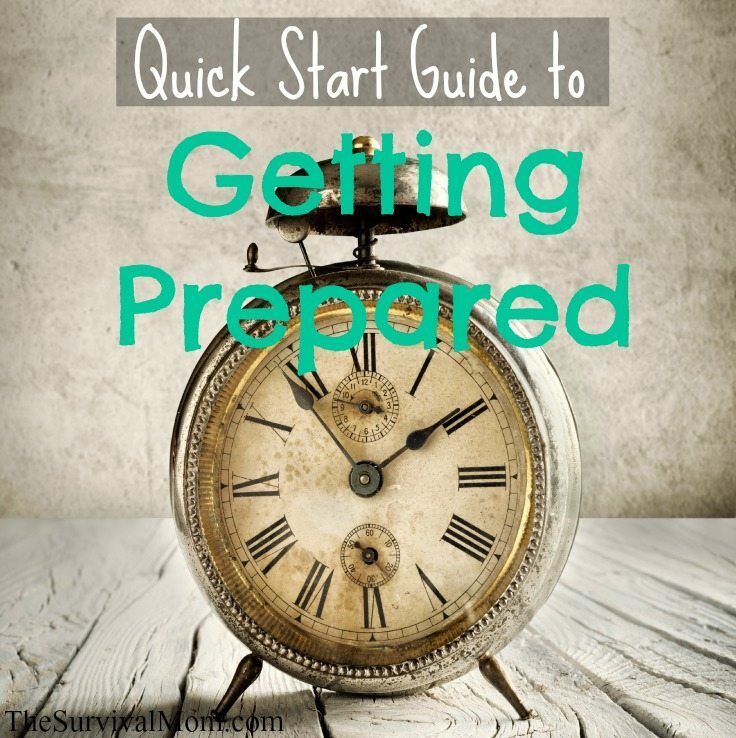 Even if the end of the world doesn’t happen in the next few days, these Quick Start steps will turbo-charge your preparedness and put you in a solid position to continue on. No one is every so fully prepared they can afford to stop. There’s always something more to learn, one more thing to do. Be sure, though, to let your mind be at peace, knowing you’ve made some important strides toward preparing your home and your family. 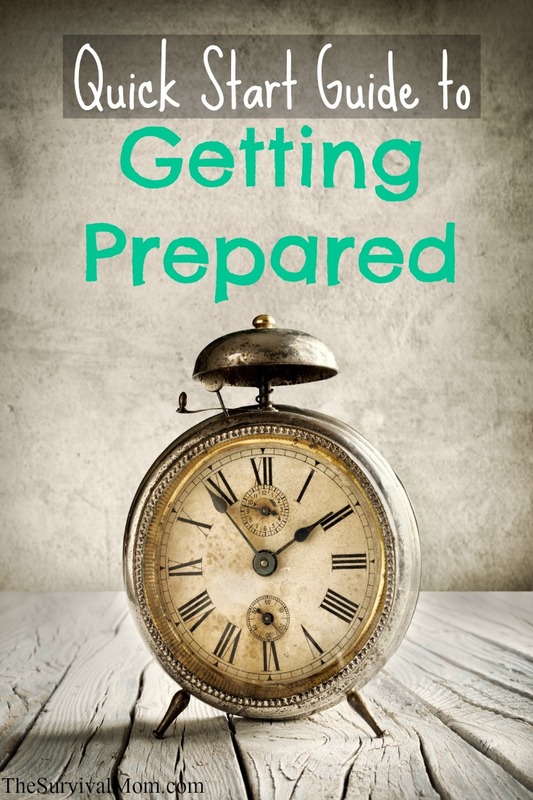 For a downloadable copy of this article, The Quick Start Guide to Getting Prepared. Originally published July 28, 2011. 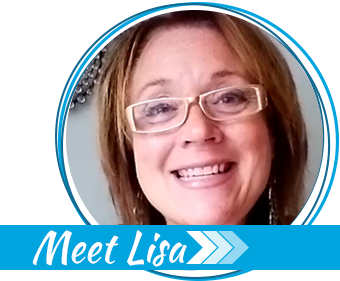 Thanks Lisa, just what I was looking for! I know I am blessed to have been thinking along these lines and prepping with my husband for the past five years or so, but every reminder helps and there a couple items in your checklist we need to work on. For example, in our current home (unlike the last two) we do not have an independent means of heating the home — this place relies on electricity and heating oil deliveries. While our goal is to move to a larger farm and have a wood burning furnace again, we need to be realistic about our options if TEOTWAWKI happens before we've settled in to our "forever" homestead. Great list and timely, too. I would add that it would be wise to make that appointment with the doctor and dentist to address medical issues right now. Even a physical or dental cleaning at the minimum. I just had both and my blood levels were very good, despite my concern about my cholesterol. The doc suggested more vitamin D and fish oil. Don't put it off because there are things that can be stocked up on, like vitamins or a month's supply of a statin if needed. I think the elected officials should be encouraging people to not panic and should not be doing what they're so good at: instilling fear into people, especially the elderly by intimating that SS checks could be withheld. This is not true. Poor leadership overall. Panicky people will be frozen with indecision. Keep staying the course and have a viable plan for your family. It's almost as if they're encouraging a mass reaction. People are stressed enough and cooler heads need to prevail. Very good advice… it's definitely not too late. The only thing I might add is to consider you children's needs and/or any special situations such as with diabetics and so on. Kids, in particular, are very finicky about such things as what they eat and may not cope well in a post-disaster situation. In the past, most of this "prepper" stuff wasn't needed. In a simpiler time people could and did more for themselves. Yet they were still subject to WTSHTF. Today it seems more urgent because there's less trust on the system, and our daily life skill set is, for most of us, absolutely irrelivant if our modern convenience loaded lives are interupted. As for why so few prepare, easy. Most people deny problems until they hit them in the face. I feel like I am very late to the party, and I am feeling overwhelmed, but I truly appreciate your blog and all the advice. Thank you. One step at a time I will get my family prepared. You mention in this article a downloadable first aid book, can you recommend one in particular? Also, I would really love to learn more about solar and non-electric means of particularly cooling my home (I live in SC on the coast-hot!). I haven’t seen anything yet on your reading list on either topics, I’d appreciate any help. thankyou. this was very helpful. but what about children and adults with searous health problims? I have been a subscriber for quite awhile and really appreciate all the useful information you provide. However, I was extremely disappointed in your Highlights & Lowlights of the Democratic Convention included in a recent post. I am a registered Democrat & I am sure there are many others included in your subscribers. It was a very offensive article for me. I would not dream of posting my political views on your website and expect better of you. This should be a totally non-partisan, educational site. I sincerely hope my link was the most traumatizing thing that happens to you this week.